To use my 16% rule to accelerate diffusion of innovation you need to identify who your innovators and early adopters are. As part of a project I am working on I have started using Klout, a social media influence scoring tool to help find these key influencers, and it has proved invaluable. I recently interviewed Klout’s Influence Marketing Manager Megan (@meganberry) to share the thinking behind this tool with the Maloney on Marketing family. Enjoy! Klout measures influence across the social web. We believe everyone has influence and our goal is to understand and measure that influence. What inspired the development of Klout? Our CEO, Joe Fernandez had jaw surgery and couldn’t speak for three months. He became deeply involved in social media and obsessed with the idea of influence online. Klout was born soon after. We have a few markets — one is consumers interested in understanding their influence, a second is brands looking to connect with influencers, and a third is applications who integrate the Klout Score. How is Klout useful for marketers? Understanding who you’re connecting with is vitally important for marketers. 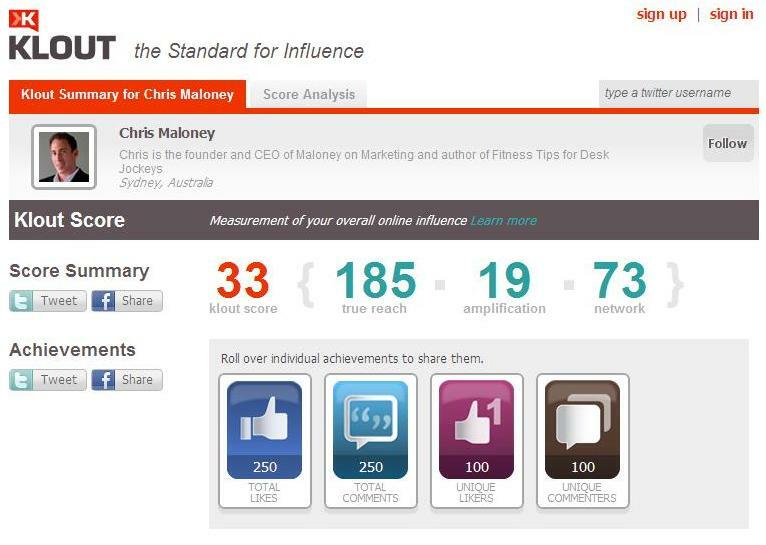 Klout gives you insight into the network value or influence of your audience and users. Do you have any Klout success stories? Yes, many big brands such as Disney, Audi, and Nike have used Klout to connect with influencers and give them Klout Perks. Klout Perks allows businesses to connect with influencers by giving them a chance to try out a new product or an experience they can share with their network. We have a strict code of ethics that states that influencers are not required to do anything about these Perks. However, if they like the product many will choose to share that. How are you marketing Klout? We’re lucky in the sense that many of our users help us do that. Our goal is to empower our users so they want to spread the word. We also help people understand their influence in our blog and host events periodically to get influencers together. Our goal is to be the standard for influence online and, towards that end, we aim to integrate many more social networks to have a more comprehensive score. ← When is using performance networks a brand risk?